Tyres play a major part in equestrian life whether they are on a horsebox, trailer or towing vehicle, so educating its members about correct tyre maintenance has become a passion for Sheila Hardy, senior executive for safety. Why did the British Horse Society get involved? The British Horse Society believes it has a duty of care to ensure all of its members, particularly those who transport horses, are kept informed on how to stay as safe as possible. What did the British Horse Society do? Members were invited to attend a programme of equestrian transport days where they could learn about the importance of tyre safety. At these days, the British Horse Society used a host of TyreSafe campaign materials including part worn tyre leaflets, horse box and trailer tyres leaflets, a tyre poster with ‘energy efficiency’ labelling and a DVD on part worn tyres. But that wasn’t all, as delegates were all given tyre gauges and offered the chance to a walk around both a horsebox and trailer/vehicle combination to check the condition of the tyres. 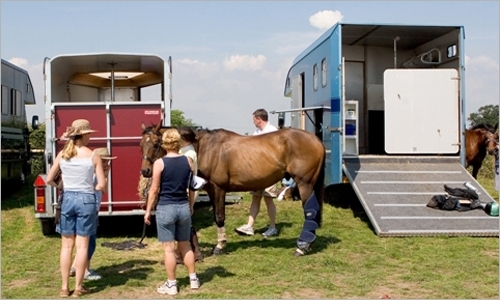 As well as educating its own members, the British Horse Society also works with equestrian and agricultural students at various colleges where pupils are taught about transport safety. While most delegates who attend equestrian transport days are amazed at the issues surrounding tyres, the good news is that they leave with an increased understanding of how important it is to look after their tyres to stay safe on the road.